Team UK finished 10th with no less than 20 medals, one gold, three silver, three bronze and 13 medallions of excellence. 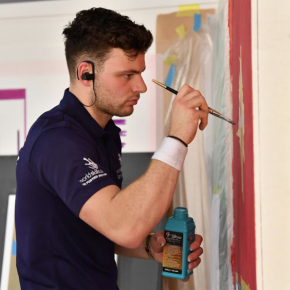 22 year-old Jordan Charters won his place in Team UK after a great performance in the Crown Trade Apprentice Decorator of the Year contest, in association with SkillBuild, in 2015. Jordan was one of 34 young apprentices to complete 4 days of competition at the 44th WorldSkills Finals in October, following regional heats, a national final, a Team UK selection process and months of training. Lindsay Hall, Crown Trade Brand Manager, said: “Jordan started on this journey to Dubai through our Crown Trade Apprentice Decorator of the Year competition.